View More In Food Coloring. 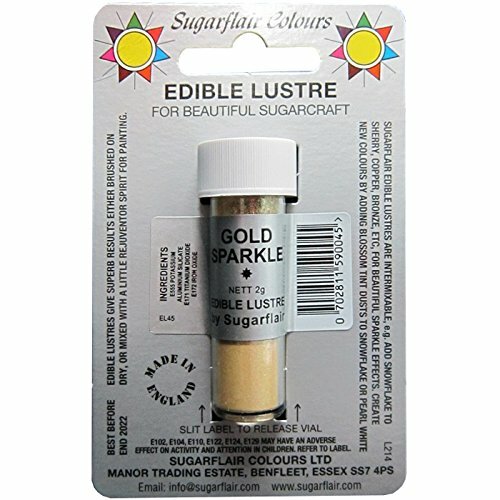 Sugarflair Edible Lustre Dust Colouring for Cake Icing and Sugacraft is a 100% Edible Lustre Dust for decorating cakes and cupcakes. Dust onto your Sugarcraft and edible flowers to give an irresistible shimmer. Use dry or mixed with rejuvenator spirit to create an edible paint.Completely nut-free, gluten free, GM-free, fat-free and suitable for suitable for vegetarian, Halal and kosher diets. Supplied in a small vial, contains approx 7ml (2g). If you have any questions about this product by Sugarflair, contact us by completing and submitting the form below. If you are looking for a specif part number, please include it with your message.